4-Burner Natural Gas Grill with Cabinet | New Style Map - A Map For Your Fashion And Styles! 4-Burner Natural Gas Grill with Cabinet This BBQ grill is a natural gas unit and you must have natural gas plumbed out to your patio or deck to be able to use this grill. 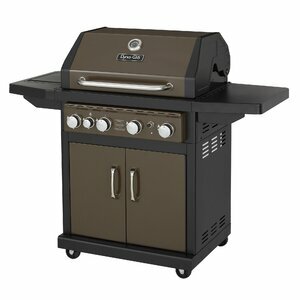 No patio or deck is complete without this 4 burner with side burner gas grill from Dyna-Glo. This grill boasts a burnished bronze metallic finish that is durable and easy to clean. This grill offers the size and performance needed to grill just about any type of food. The lid is double-walled to minimize heat loss and improve the cooking efficiency of the burners.